• Prioritize your tasks and work accordingly. • Take help from family and friends openly. • Get to know the baby's sleeping pattern slowly and match your sleeping hours accordingly. Taking sufficient rest is the key to freshness! • Exercise regularly - very important! • Eat well; do not start dieting until the first six months after delivery. • Listen to your favourite music; watch your favourite movies whenever you get time. • Take your parlour visit quickly when the baby is asleep. • Maintain hygiene to avoid any infections. 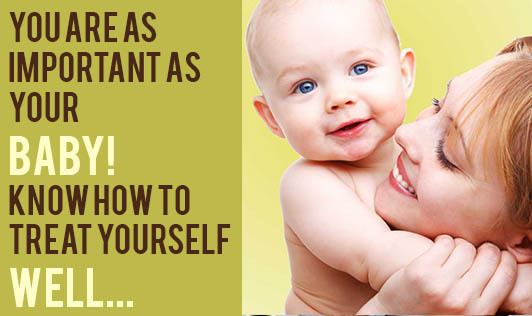 Treat yourself well and enjoy motherhood better!